Unprotected utility floors can show wear, show stains from oils and fluids, and be damaged by the corrosive effects of snow and ice-melting chemicals like rock salt. Our Garage Floor Epoxy Kit protects your concrete surfaces from wear because it is actually harder and more durable than the concrete itself. Our 100% solids resin based coating is so dense that oils, salts and fluids cannot penetrate its surface to soak in and cause staining. The formula is so durable that even hot tires will not damage its surface like the leading competitor's water-based garage paint. The complete garage floor coating kit with easy-to-follow instructions will guide you through the entire process. Before you start the easy installation process, you must sweep and vacuum the floor to remove all dirt, dust, and debris. A clean surface is essential. Remove oil stains and contaminants using a degreaser, and patch any spider cracks using a non-silicon, latex, paint-able caulk. For larger cracks and control joints, purchase our Floor Patch Kit. Not only will you give your garage a finished look, but it will be easy to clean, hide annoying imperfections in the concrete, and the optional aluminum oxide (non-slip additive) will give you the grip you need on a rainy or snowy day. Your garage will be transformed into a maintenance free showroom with EpoxyPro floor solutions. 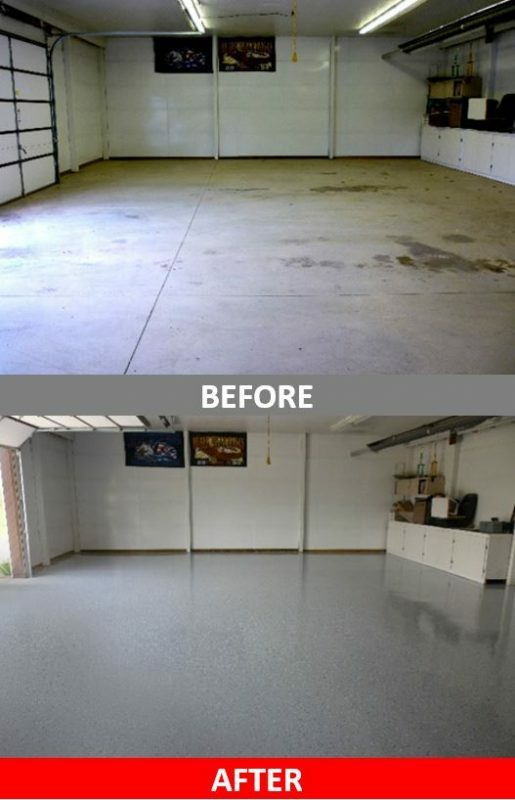 Purchase an EpoxyPro Garage Floor Coating Kit The transformation will astound you! BUY NOW! Available Epoxy Kits! Or Call EpoxyPro to place your order.